Keep family heirlooms, priceless photos, sentimental memorabilia and more protected in fun, floral style with this '70s inspired keepsake box. Personalized tile measures 4" x 4"
The 1970's were an era of bold prints, fun colors, and unity. Whether you're inspired by those elements or want to preserve precious memorabilia from that decade, this fun and functional wooden keepsake box is the perfect choice. 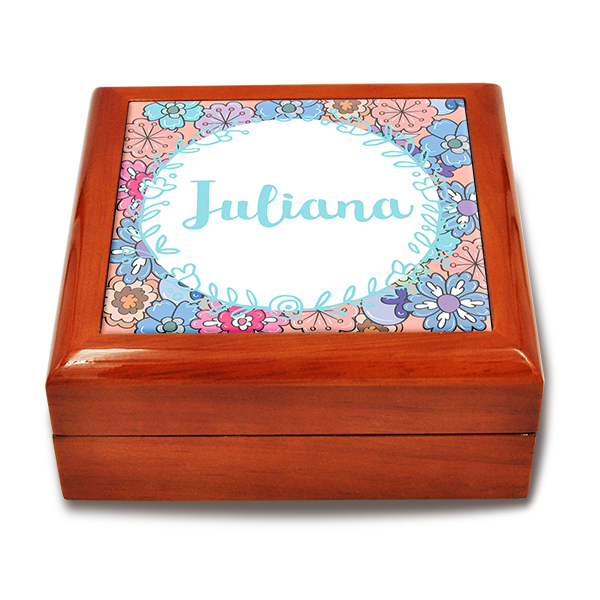 Featuring solid wood construction and soft, velvet interior lining, you can customize your funky, yet sophisticated Floral Pop Keepsake Box for a nostalgic piece that holds your most priceless memories.